Momentum Group offers a variety of finish options for in-line products. In-line finishes or backings can be ordered directly through Customer Service and applied to in-stock cut yardage. 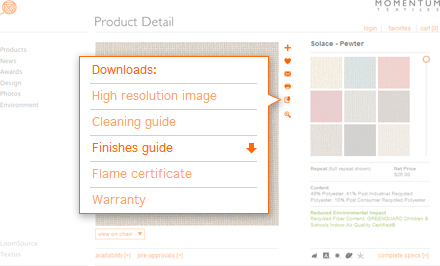 To view the in-line finishes available for a specific product, download the Finishes Guide from the Product Detail page. Contact your dedicated customer service representative at customerservice@momtex.com if you have any questions.